Mediven Elegance Thigh High Compression Stockings exert gradient compression within the range from 20-30 mmHg to 30-40 mmHg on your legs while providing relief to your swollen legs. 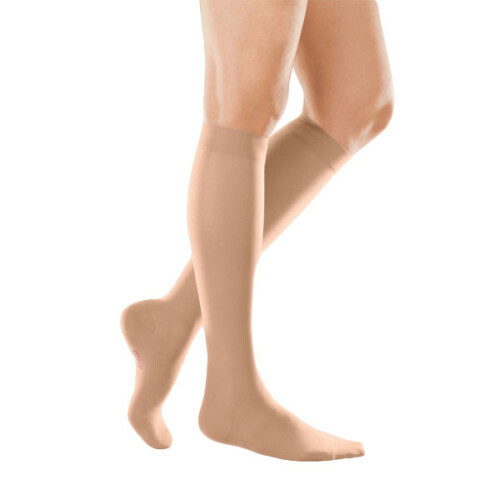 These thigh high compression stockings increase circulation while reducing the impact of lymphedema, edema, and venous insufficiency. Made with innovative Medisilk yarn for maximum sheerness and softness, these thigh high compression stockings let your skin breathe and maintain freshness while boosting your energy for daily activities. Mediven Elegance Thigh High Compression Stockings can easily treat moderate to severe varicose veins, moderate swelling, moderate edema / lymphedema, varicose veins during pregnancy, leg swelling following surgery, sclerotherapy, orthostatic hypotension, postural hypotension and help prevent DVT (Deep Vein Thrombosis).